Background Alopecia is a common adverse effect of chemotherapy treatment for cancer; for some patients, it results in complete hair loss. The effect of hair loss among patients remains an important nursing issue. Aim The aim of this study was to examine the effect of scalp cooling on the development of alopecia in female patients receiving cancer chemotherapy. Sample Fifty female patients with first-stage primary breast cancer fit for primary chemotherapy were randomly allocated to two equal groups using block randomization. The study group patients were to use the scalp cooling, whereas the control group patients did not use it. Design A randomized clinical trial design was used in this study. Sitting This study was conducted at the Surgical Oncology Department and Dermatology Clinic at Ain Shams University Specialized Hospital. Tools Data collection tools included demographic and clinical data sheet, modified WHO hair loss scale, self-reported hair loss scale, and hair re-growth scale. An instruction brochure for patients was prepared by the researchers. Results The results demonstrated protective effect of cooling as assessed by modified WHO hair loss scale, where at the end of follow-up, 92% of the study group patients had successful protection, compared with 64.0% in the control group (P=0.02). Moreover, by self-reported hair loss scale, 68.0% of the patients in the study group reported less hair loss not requiring a wig, compared with only 12.0% of those in the control group (P<0.001). 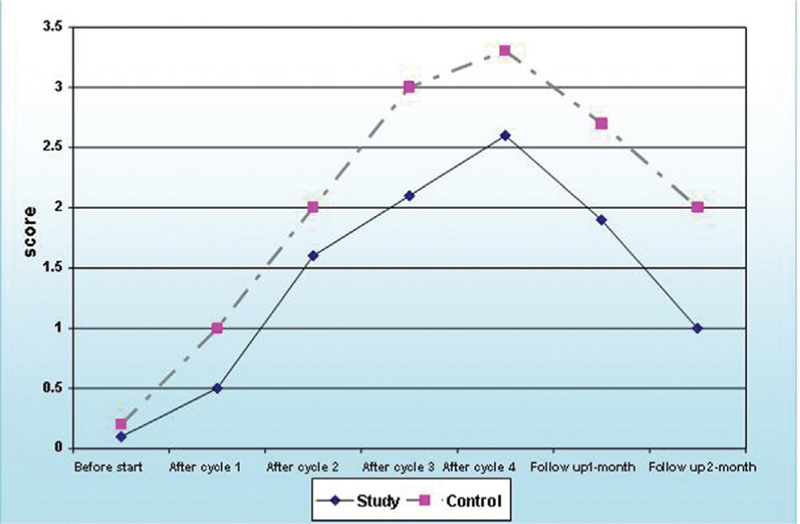 Moreover, hair re-growth improved in the study group compared with the control group during the first and second month of follow-up (P=0.007 and 0.02, respectively). Conclusion It is concluded that scalp cooling provides significant successful protection from hair loss during cancer chemotherapy course, and for 2 months after completing the treatment. Recommendations It is recommended that scalp cooling should be initiated 15 min before infusion, maintained during, and for 30 min following completion of chemotherapy session. Further study of the long-term effect of scalp cooling on protection from alopecia, with psychological and clinical assessment is proposed. Breast cancer is the most common cause of death among women worldwide (Smeltzer and Bare, 2000). According to the American Cancer Society, breast cancer rates have risen ∼30% in the past 25 years worldwide. Each year, more than 182 000 women are diagnosed with breast cancer. If current rates of increase remain constant, a woman born today has a one in 10 chance of developing breast cancer (Cohen, 2006). In Egypt, breast cancer is the most common cancer among women. According to the latest annual statistics of the National Cancer Institute in Cairo (2005), ∼125.5/100 000 women per year are diagnosed with breast cancer. More than half of all patients diagnosed with cancer receive chemotherapy treatment, which can destroy the rapidly growing cancer cells (Lewis et al., 2000). However, certain normal cells of the body that rapidly grow are affected by the chemotherapy drugs. Rapidly growing cells are found at the base of the hair (hair bulb). When the drug destroys the cells of the hair bulb, the hair fall out (Lemieux and Maunsell, 2007). Alternatively, the drug may cause hair thinning; these weakened hair are prone to drop during normal brushing or shampooing (Batchelor, 2008). Alopecia is a common adverse effect of chemotherapy treatment for cancer; for some patients, it results in complete hair loss (Davis et al., 2001). It has been recognized generally as diffuse thinning, often worse centrally, but not culminating in complete baldness (Ueki et al., 2003). Alopecia caused by chemotherapy occurs between 2 and 3 weeks after the first treatment and often hair loss is gradual (Baxley et al., 2004). Loss of head hair usually begins on the top (crown) and sides of the head, presumably owing to friction caused by pillows, bed linens and hats (Dougherty, 2006). Once treatment is over, hair starts to grow back, and the patient will have a full head of hair after 3–6 months. Hair loss is temporary; however, how it will grow back is unpredictable. Moreover, re-grown hair may be of different color or type than before treatment (Mulders et al., 2008). Alopecia may seriously affect one’s body image, which in turn has an effect on self-esteem and self-confidence (Cash, 2001; Hunt and McHale, 2005). Consequently, it may cause emotional suffering, which may lead to personal, social, and work-related problems and may have a negative effect on quality of life and even on curative therapy (Munstedt et al., 2006). Preservation of hair during chemotherapy is expected to contribute positively to the well-being of patients with cancer (Carelle and Piotto, 2002). Prevention of alopecia has been a focus in the medical and nursing literature since the late 1960s. Since the 1970s, preventive efforts such as tourniquet, medications, scalp cooling, and biological agents have been applied to prevent chemotherapy-induced hair loss (Peck et al., 2003). In recent times, scalp cooling has received increased attention as a technique to prevent alopecia in chemotherapy (Mols et al., 2008). It consists of use of cold caps that are worn on the head to reduce and/or prevent hair loss caused by some chemotherapy drugs (MacDuff et al., 2003). Historically, scalp cooling was achieved using crushed ice in plastic bags and the first commercial cap (cold cap) was used successfully in the early 80s (Witman, 1981). More recent work has involved the use of the newer generation of gel-filled cryogel caps or ‘cold caps’ stored in freezer (Dougherty, 2006). Two scientific rationales constitute the basis of scalp cooling. The first is vasoconstriction, which reduces blood to hair follicles during peak plasma concentrations of the chemotherapeutic agents, and so reduces cellular uptake of these agents. The second is coldness itself, which reduces the biochemical activity by directly reducing chemotherapy metabolic rate, which makes hair follicles less susceptible to the damaging effect of chemotherapeutic agents (Bulow et al., 2005). The cold cap should fit snugly to the head to achieve maximum effect. It should be worn for every therapy session, as an interruption will compromise its efficiency (Corina et al., 2008). Cooling must be started ∼15 min before chemotherapy and must continue for 30–90 min after the conclusion of treatment (Perevodchikova et al., 2000). The success of scalp cooling depends on many factors like type of cytostatics, as well as the doses and number of chemotherapy courses (Ueki et al., 2003). It was recommended for all patients receiving epirubicin as a single agent or in combination with other cytotoxic drugs, which causes minimal hair loss (Grevelman and Breed, 2005). Moreover, Carolyn and Massey (2007) added that scalp cooling is most commonly used for patients who have solid tumors. Meanwhile, scalp cooling cannot be used with hematological diseases like myeloma, leukemia, and lymphoma owing to risk of scalp metastasis, and also patients receiving drugs that cause severe hair loss such as etoposide, and patients with reduced liver function (Dougherty, 2006). Many studies in the literature described the use of scalp cooling from the 1970s onward (MacDuff et al., 2003). From seven randomized clinical studies, six considered scalp cooling to be effective. The average success rates reported increased from 56% before to 73% from 1995 onward (Grevelman and Breed, 2005). However, scalp cooling can be uncomfortable, but its adverse effects are very rare. Some patients experience headache and/or dizziness and may complain of nausea (Lemieux and Maunsell, 2007). Although these adverse effects are not life-threatening, alopecia does contribute to patient anxiety regarding cancer diagnosis and treatment (Mulders et al., 2008). Nonetheless, Dougherty (2006) noticed that the severity and distress associated with hair loss may be lower with those use of scalp cooling. Nurses have an essential role in helping patients under chemotherapy to enhance the effectiveness of treatment and avoid its adverse effects. In this respect, Nolte and Donnelly (2006) emphasized that nursing interventions should be directed toward helping the patient and family adapt to and deal with alopecia. Patient education, identification of available resources, and supportive listening are examples of nursing therapeutic interventions. Since the early work on chemotherapy-induced alopecia, the effect of hair loss among patients remains an important nursing issue. Alopecia resulting from cancer treatment is unavoidable and no treatments are available for it. Although alopecia is a harmless, painless condition, it can significantly affect body image, self-esteem, and sexuality. As a result, alopecia may cause the patients to limit social activities and refuse treatment for fear of losing their looks. The condition is more serious among women undergoing chemotherapy. They find difficulties in using wigs, because it feels strange, hot or uncomfortable. Therefore, major interests are focused on scalp cooling, which can result in a high level of retention or complete hair preservation, with consequent improvement of patient’s self-confidence, motivation and participation in therapy. The end result is a positive attitude toward the recovery process, in addition to improvement of patient quality of life. Moreover, it is a simple procedure that does not need much preparation or resources, with ease of use and application. The aim of this study was to examine the effect of scalp cooling on the development of alopecia in female patients receiving cancer chemotherapy. It was hypothesized that the female patients on chemotherapy who receive scalp cooling will have a lower incidence of alopecia compared with the control participants who do not have scalp cooling. A randomized clinical trial design was used in this study. The research was conducted at the Surgical Oncology Department and Dermatology Clinic at Ain Shams University Specialized Hospital. Fifty female patients were consecutively recruited in this study. The inclusion criteria were being diagnosed as having first-stage primary breast cancer, fit for primary chemotherapy (2 successive days epirubicin-docetaxel course), and educated to ensure ability to follow instructions for use of scalp cooling. Patients who had previously used scalp cooling, and those who had combined course of chemotherapy and radiotherapy, or receiving other drugs that cause hair loss (e.g. cyclophosphamide, daunorubicin, doxorubicin, etoposide, ifosfamide and paclitaxel) were excluded. The exclusion criteria also involved patients who were bald or had debilitating scalp/hair problems, for example dryness, thinning or splitting before the onset of chemotherapy; those who had leukemia; who had cold sensitivity; who had a tendency of hemocoagulation; or who previously had cranial irradiation or vasculitis were ineligible. In addition, patients with comorbid diseases such as liver diseases, diabetes mellitus, ischemic heart diseases, anemia, or taking medications that may influence the development of alopecia after chemotherapy were also excluded. After application of the inclusion and exclusion criteria, the consecutive 50 patients were randomly allocated to two equal groups, with 25 participants each. The study group patients were to use the scalp cooling, whereas the control group patients did not use it. The following tools were used to collect data. Demographic and clinical data sheet: it was designed by researchers to record patient demographic data, as well as the type of surgery, whether total mastectomy or conservative surgery and lymph nodes dissection. This tool was filled once by the patient. Modified WHO hair loss scale: it used to measure the severity of hair loss (alopecia) by researchers according to the duration of chemotherapy. It was adopted from Corinaet al.(2008). The grading of hair loss was as follows: grade 0=none (no hair loss), grade 1=less than 25% (minimal hair loss), grade 2=25% to less than 50% (moderate hair loss), grade 3=50% to less than 75% (extensive hair loss), and grade 4: 75%+ (complete hair loss). Grades 0–2 were considered successful protection and 3–4 as failure. Photographic Assessment: this was used together with modified WHO hair loss Scale by researchers. Photographs were provided which best described the hair condition associated with each grade and showed the head and scalp areas in study and control groups. Self-reported hair loss scale: it was adopted form Deanet al. (2000), and this scale was used to assess the total overall hair loss as reported by the patient. It was recorded weekly by the patients in both groups from the first week of chemotherapy course to the first week of the following chemotherapy course. The grading is as follows: grade 0=no hair loss, grade 1=minimal hair loss, grade 2=moderate hair loss, grade 3=extensive hair loss, and grade 4=complete hair loss. Successful protection was defined as the grades not requiring a wig, that is, grades 0–2, whereas grades 3–4 were considered failure of protection, as the patient required a wig. Hair re-growth scale: it was adopted from Chamberlain and Dawber (2003), and this scale was used to assess hair growth rate (mm/month) within the scalp after the first and second months from the treatment. It classified scalp hair growth into four categories as follows: 0 mm hair length/month=no growth (i.e. not improved), less than 2.5 mm=minimal to definite growth without substantial covering of the thinning area (i.e. slight but definite improvement), 2.5 to less than 5.0 mm=moderate to new growth that partially covers the thinning area (i.e. marked improvement), and 5.0 to at least 7.5 mm=dense growth to full coverage of thinning areas (i.e. very good improvement). This was adopted from Dougherty and Lister (2008), ‘Hair Loss and Scalp Cooling for Patients Receiving Chemotherapy’ and translated into Arabic by the researchers. It was intended to help the patient to learn how scalp cooling could save her hair during chemotherapy, and give instructions to solve the problem of hair loss through using scalp cooling. It included simple instructions about what is scalp cooling, its benefits and effects, how it works, its safety, and specific considerations for hair care during chemotherapy course. Three dermatologists and two oncologists were invited to validate the content of the brochure before distribution to patients. Some modifications were done based on their opinions. A pilot trial was carried out on five female patients who were in surgical oncology department with the same inclusion and exclusion criteria. A verbal consent was obtained from each patient. Based on the pilot trial findings, necessary revisions were made in the data collection forms, and a schedule was developed for using scalp cooling. These five patients were not included in the main study sample. Patients were assigned to either the study group or the control group using block randomization. Blocks of 10 patients were recruited, and five were randomly assigned to each of the two groups. This process was continued until a total of 50 patients were recruited. All patients were undergoing combined anticancer chemotherapy for the first time, with 2 consecutive day protocol (epirubicin-docetaxel course). The patients received an intravenous bolus dose of 50 mg/m2 epirubicin for 30 min followed by 1 h intravenous infusion of 50 mg/m2 docetaxel at each chemotherapy treatment. Several studies found that increasing doses of epirubicin and docetaxel (>50 mg/m2) diminished the effectiveness of scalp cooling (MacDuff et al., 2003). The course included four cycles of 3 weeks each. A cycle has six treatment sessions lasting for 3 weeks (2 sessions/week). Before starting any interventions, baseline data were assessed in both groups using the demographic and clinical data collection tool. Then, patients in both groups were trained in how to use self-report hair loss scale from the first week of chemotherapy course until its end, that is, throughout 12 weeks. Then, baseline measurements were done using the related tools as follows. Modified WHO hair loss scale: The researchers used this scale to make scalp evaluation for hair loss before start of chemotherapy, after each cycle, and after first and second months from completing chemotherapy as follow-up. The researchers were trained on using the scale, and applied it on 20 patients with alopecia. Then, in the main study, they assessed the 50 patients in the two groups, using this scale with the help of a dermatologist. Photographic assessment was done at the same time using a digital camera. Two photographs (back and top view) were taken to assess hair loss using modified WHO hair loss scale. A stereotactic positioning device with mounted camera and flash device was used. Patient’s forehead was fixed on the device to ensure that the view, magnification, and lighting are the same at consecutive study visits, thus enabling precise follow-up of the same region of interest. Routine serial photographs of the scalp were obtained. Self-reported hair loss scale: scale forms were distributed to the patients in both groups after training and instructions about the time of assessment. The grading forms were returned when the patients came back for every next cycle. Hair re-growth scale: researchers evaluate hair re-growth at the end of the last cycle (cycle 4) as a baseline for comparisons with follow-up at the first and second months after completion of chemotherapy course. Hair length was measured by placing a tiny calibrated tube over patient hair and measuring from the scalp to the hair tip regardless of location; 10 hair strands from different areas of the scalp were measured, and their average length was taken as an indicator for hair re-growth. Consistency from one measurement to the next was ensured, and the measurements were then recorded. Cycle 1: before the study group, patients used the scalp cooling for the first time. The brochure was distributed to educate them about the scalp cooling and the hair advices during it. According to Dougherty and Lister (2008), the patient should be given written and verbal information to explain this procedure and its potential benefits and limitations, that is, information on variable success rate. Then the first cap was applied for 15 min before chemotherapy was started. It is important to arrange with the patient to try scalp cooling before starting chemotherapy, so that she knows what to expect (Grevelman and Breed, 2005). Before patients started using scalp cooling, measurements were done in both groups as a baseline data. Cycles 2–4: at the end of each cycle, the researchers evaluated hair loss using photographic assessment, and the patients provided weekly self-reports regarding their hair loss throughout the course. At the end of the last cycle (cycle 4), hair re-growth scale was applied. Follow-up: this was done for the first and second months after completing chemotherapy course. The researchers evaluated hair re-growth for the patients in the study and control groups with hair loss tools. A cooling cap of the correct size was selected to ensure good contact with the scalp for most effective cooling. A prefrozen handmade gel rubber cap was cooled at 2–4°C and kept in the refrigerator. The cap had three layers: inner thin cotton layer, middle high dense gel layer, and outer thin cotton layer to protect any exposed skin on the forehead and ears. Before beginning scalp cooling, patient’s hair was wetted to improve thermal contact between the scalp and the cooling cap. It was applied to patients in the study group for 15 min before the start of chemotherapy sessions as recommended by Batchelor (2008). Cooling remained on scalp during the infusion period depend on 2 consecutive days protocol (epirubicin infused 30 min followed by docetaxel 60 min, i.e. total infusion was 90 min). Three cooling caps were used during infusion, each one staying on for 30 min. This would lower scalp temperature to 32°C within 5 min, until stabilized at 22–24°C thereafter. This temperature has to be maintained for 20 min for hair preservation Carolyn and Massey (2007). The last cooling cap remained for 30 min on the scalp after completion of chemotherapy session, the half-life time of epirubicin-docetaxel course, which makes prophylactic scalp cooling feasible Dougherty (2006). Thus, for scalp cooling to take place, the gel-filled caps need to be worn for almost 2.15 h. Bulow et al. (2005) emphasized that the cooling time seems to influence the success rate, and the median success rate was 76% when the cooling time was 90 min or more. The cap was renewed five times during each chemotherapy treatment. This is according to Lemenager et al. (2007) who reported that the better results for effective scalp cooling method are obtained when more cooling caps are applied to patients. Scalp temperature returns to systemic level within 10 min after cessation of hypothermia (Jam et al., 2009). After cooling process has finished, patient hair was left to dry naturally and patient was asked not to use hair dryer for the next few hours. Patient may feel cold during the first 10–15 min of scalp cooling, so blankets and hot drinks were used when needed. After use, each cap was cleaned with a wipe sponge with soap and water, and left to dry. It was then returned to the refrigerator with the three layers and left for at least 12 h before reuse. In the planning stage, approval was obtained from Ain Shams Specialized Hospital, and permissions were obtained from surgical oncology department and dermatological clinic administration and head nurses. All patients were informed about the procedure and about their rights according to medical research ethics, and they were free to decide whether or not they would participate in the study without any effect on their care. Then, patients gave their written informed consents after being briefed about the nature of the study, the length of the procedure, and the chance of success, in addition to any adverse effects. Data entry and statistical analysis were done using SPSS 14.0 statistical software packages (IBM Corporation, New York, NY, USA). Data were presented using descriptive statistics in the form of frequencies and percentages for qualitative variables and means and SDs for quantitative variables. Quantitative continuous data were compared using the nonparametric Mann–Whitney U-test as normal distribution could not be assumed. Qualitative categorical variables were compared using χ2-test. Whenever the expected values in one or more of the cells in a 2×2 tables were less than 5, Fisher exact test was used instead. In larger than 2×2 cross-tables, no test could be applied whenever the expected value in 10% or more of the cells was less than 5. Statistical significance was considered at P-value less than 0.05. The study and control group members had closely similar age, marital status, type of surgery and lymph nodes dissection, with no statistically significant differences between them ([Table 1]). In both groups, female patients were mostly 50 years or older. More than half of them had breast conservative surgery without lymph nodes dissection. The successful protective effect of cooling as assessed by modified WHO hair loss scale among patients in the study and control groups at various assessment phases is displayed in [Table 2]. It can be noticed that the two groups were similar before the start of chemotherapy, and after the first cycle, with no differences of statistical significance. However, after cycle 2–4 of the study, statistically significant successful protection from hair loss was clear in the study group and continued up to second month of follow-up after completing chemotherapy course. At the end of follow-up, 92% of the study group patients had successful protection, compared with 64.0% in the control group (P=0.02). Similarly, the statistically significant successful protection of cooling as measured by the self-reported hair loss scale was evident from the fourth week onward ([Table 3]). At the end of week 12, 68.0% of the patients in the study group reported less hair loss not requiring a wig, compared with only 12.0% of those in the control group (P<0.001). A comparison of the changes in hair re-growth among study and control group patients at various assessment phases is displayed in [Table 4]. It can be noticed that the two groups were similar at the end of cycle 4, with no differences of statistically significance. However, on the first and second months of follow-up, hair re-growth improved in the study group compared with the control group. The difference was statistically significant during the first and second month of follow-up (P=0.007 and 0.02, respectively). By the end of the second month of follow-up, those with dense hair re-growth, that is, very good improvement, were 52% in the study group compared with only 12% in control group. When the mean scores of modified WHO hair loss were compared between the study and control groups, the differences were statistically significant starting from the first cycle (P=0.01) as shown in [Figure 1]. It is noticed that the peak mean of hair loss (alopecia) was after cycle 4 in both the study (2.6±0.8) and control (3.3±0.7) groups. It then declined down to the second month of follow-up, reaching 1.0±1.2 and 2.0±1.4, respectively. 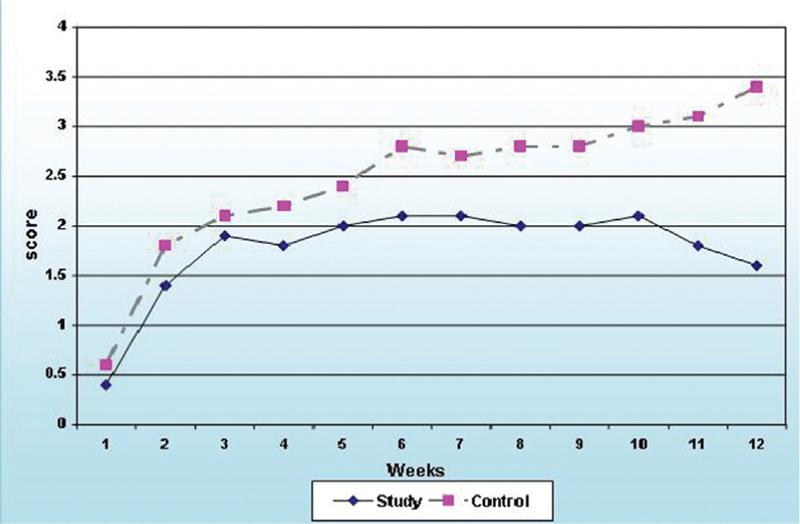 Figure 1 Mean scores of modified WHO hair loss scale among patients in the study and control groups at various assessment phases. As for self-reported hair loss scale, [Figure 2] demonstrates that the mean hair loss was higher in the control group throughout the study phases, with statistically significant differences at the second week, and from the fourth week on. It is also noticed that the mean score of hair loss had an increasing trend in the study group till the seventh week, when it started to decline. On the contrary, the increasing trend continued in the control group till the 12th week. Figure 2 Mean scores of self-reported hair loss scale among patients in the study and control groups at various assessment phases. [Figure 3] shows that the mean scores of hair re-growth in the study group were higher at the first and second months of follow-up compared with patients in the control group, with statistically significant differences (P=0.001 and 0.005, respectively). 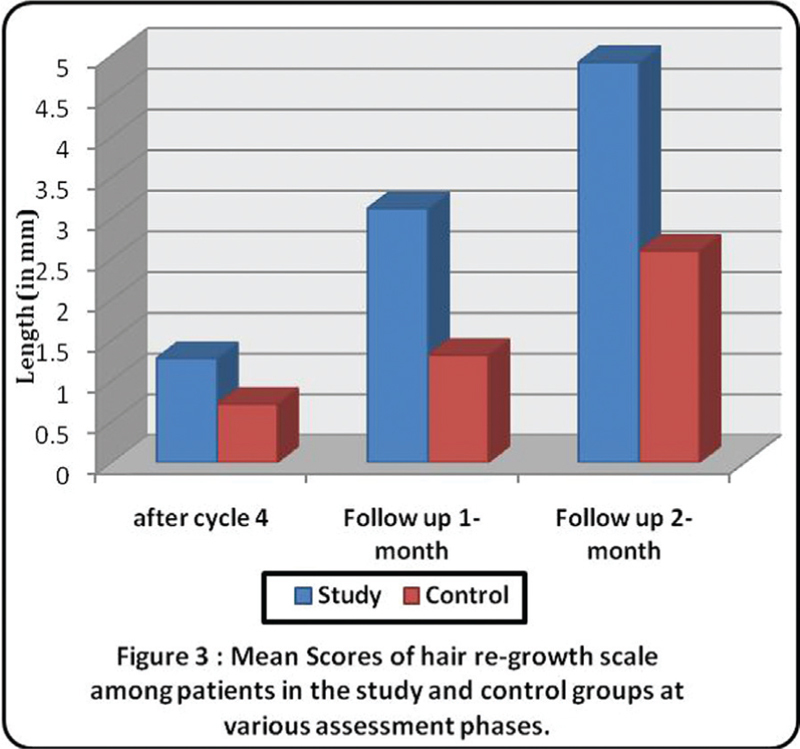 Figure 3 Mean scores of hair re-growth scale among patients in the study and control groups at various assessment phases. Since the early work on chemotherapy-induced alopecia, the effect of hair loss remains an important nursing issue (Dougherty, 2006). The medical and nursing literature indicates that the use of scalp cooling with chemotherapy protocols can effectively prevent alopecia and result in improved quality of life (Batchelor, 2008). By conducting researches on scalp cooling for prevention of chemotherapy-induced alopecia, it would help the oncology nurses to enhance knowledge and skills related to proper patient care and proper use of scalp cooling. Nurses would then be able to utilize newer evidence-based techniques to ensure better patient comfort and safety (Jam et al., 2009). This study aimed at examining the effect of scalp cooling on the development of alopecia in female patients receiving chemotherapy. It has been hypothesized that female patients receiving chemotherapy as well as scalp cooling will have a lower incidence of alopecia, compared with control group patients who will not have scalp cooling. The study revealed that both groups were similar regarding their demographic and disease characteristics. This similarity of patients indicates success of the randomization process and is necessary to obviate any undesirable confounding effect of these variables on the outcome of the study. Moreover, comparison of hair loss measurement before the start of chemotherapy revealed no statistically significant differences between them. This was also important to ensure comparability of the two groups, and further confirm successful randomization. According to the present study findings, successful protection from hair loss was demonstrated through the use of various assessment scales. In all of them, there were statistically significant improvements among patients in the study group compared with the control group. This successful protection started early after cycle 2–4 and continued to the second month of follow-up period. According to the modified WHO hair loss scale, the mean scores of hair loss were lower in study group patients, and this continued through the second month of follow-up, compared with the control group. This indicates that the risk and severity of hair loss (alopecia) decreased in the study group compared with the control group. The findings are in congruence with Dean et al. (2000) who reported that patients who received scalp cooling lost significantly less hair than those who had the standard treatment. This difference was particularly marked between cycle 2 and 6. Likewise, Peck et al. (2003) showed that the mean hair loss was lower among the study patients, compared with control group on treatment with epirubicin-docetaxel course.The findings are also in agreement with those of Roseman (2004) who reported that good protection against alopecia was observed in almost all patients after the first cycle of treatment and in 80% thereafter. On the same line, Nolte and Donnelly (2006) found that scalp cooling had definite success at 3 weeks after completion of chemotherapy. Moreover, significantly greater hair loss was noticed in control group when aggregate hair loss spanning cycle 2–6 was compared (Mols et al., 2008). In this regard, Hackbarth et al. (2009) emphasized that it is important for the scalp to remain cold during the time that the drugs causing alopecia are at their highest plasma concentration or their metabolites are reduced to sufficiently low levels in the plasma. Moreover, in agreement with the present study findings, Carolyn and Massey (2007) reported that there was acceptable hair preservation in 75% of the patients who received scalp hypothermia, compared with only 8% of the patients in the control group. Similar successful findings were also reported by Mols et al. (2008), who mentioned in their study that the cold cap was applied 20 min before, during, and 2 h after infusion and hair loss was assessed at each cycle until six cycles of chemotherapy. They found that after four cycles, 61% of patients in scalp cooling group had grade 1–2 hair loss compared with 41% of the patients in the control group. After cycle 6, 85% of patients in scalp cooling group experience grade 1–2 hair loss compared with 20% of patients in the control group, and only 15% in the scalp cooling group developed grade 4 hair loss. In addition to the objective evaluation for hair loss by physician diagnosis, the present study has also demonstrated subjective improvement of hair loss as judged by the patient. The study revealed differences of statistical significance between study and control groups from the fourth week on. Moreover, the mean scores of self-reported hair loss were higher in the control group, which means that control group patients had more severe symptom of hair loss. This finding is in congruence with Jam et al. (2009) who mentioned that hair loss can start at any time after the first few days after chemotherapy. Moreover, in agreement with these present study findings, MacDuff et al. (2003) found that the intervention group reported significantly higher protection from hair loss and better general hair condition than the control group. Similar successful results of scalp cooling as reported by patients were demonstrated by Grevelman and Breed (2005) and Nolte and Donnelly (2006). Moreover, Mols et al. (2008) reported that approximately three-fourth of patients who received scalp cooling did not use a wig and were therefore considered successfully cooled. Lemenager et al. (2007) attributed these successes to the fact that most patients tolerate cooling very well, and the adverse effects are infrequent and not serious. Nonetheless, these present study findings are in contradiction with those of Davis et al. (2001). These authors found that there was a tendency for those who had scalp cooling to report distributed hair loss, whereas the control group typically experienced more patchy hair loss. A third approach to evaluation of the effect of scalp cooling used in the present study was through measurement of hair re-growth. The findings revealed statistically significant improvements among patients in the study group compared with the control group. This improvement started 1 month from completion of the chemotherapy course, and continued to the second month of follow-up. These results are congruent with those of Munstedt et al. (2006), who reported that 60% of the patients who used scalp cooling had moderate hair growth after 2 months from treatment compared with 20% of the control patients. On the same line, Hackbarth et al. (2009) observed better hair re-growth after discontinuation of chemotherapy course for patients using scalp cooling. They explained that hair follicles respond greater to anagen (rapid cell growth) phase which would accelerate the hair cycle and thereby stimulate re-growth. Meanwhile, Dougherty (2006) clarified that patients with chemotherapy who experienced hair loss or complete baldness have fewer centimeters of hair within half a year from completing chemotherapy course, whereas Baxley et al. (2004) claimed that hair will re-grow after finished treatment between 6 and 12 months. Meanwhile, Mulders et al. (2008) reported that sometimes hair re-growth will not occur when hair follicles are irreversibly damaged by chemotherapy. In view of the study results, it is concluded that scalp cooling provides significant successful protection from hair loss during cancer chemotherapy course, and for 2 months after completing the treatment. Therefore, the study hypothesis that female patients receiving chemotherapy who will have scalp cooling will have a lower incidence of alopecia compared with the control group patients was achieved. Based on the study findings, it is recommended that scalp cooling should be initiated 15 min before infusion, maintained during the session, and kept for 30 min following completion of chemotherapy session. Further study of the long-term effect of scalp cooling on protection with psychological and clinical assessment is proposed. There is also a need to study the optimal method, temperature, and duration of cooling with various chemotherapy regimens. Lastly, it is recommended to increase oncologists and nurses’ knowledge on the effectiveness of scalp cooling. Although the study design was a randomized clinical trial, blinding was not possible because of the nature of the intervention. However, the use of three approaches to assess the effect of the intervention might decrease the effect of this limitation. The follow-up time was short owing to logistic reasons. Moreover, the procedures of scalp cooling are time consuming for the nurses who are already overloaded. Batchelor D (2008). Hair and cancer chemotherapy: consequences and nursing care − a literature study. Eur J Cancer Care (Engl) 10:147–163. Baxley OK, Kendrick EL, Brown HE (2004). Alopecia: effect on cancer patients body image. Cancer Nurs 7:499–503. Bulow J, Friberg L, Hansen M (2005). Frontal subcutaneous blood flow, and epi-and subcutaneous temperatures during scalp cooling in normal man. Scand J Clin Lab Invest 45:505–508. Carelle N, Piotto E (2002). Changing patient perceptions of the side effects of cancer chemotherapy. Cancer 95:155–163. Carolyn S, Massey C (2007). A multicenter study to determine the efficacy and patient acceptability of the paxman scalp cooler to prevent hair loss in patients receiving chemotherapy. Eur J Oncol Nurs 18:121–130. Cash TF (2001). The psychology of hair loss and its implications for patient care. Clin Dermatol 19:161–166. Chamberlain L, Dawber S (2003). Methods of evaluating hair growth. Aust J Dermatol 20:662–669. Cohen RA (2006). Health Insurance Coverage (Early Release of Estimates from the National Health Interview Survey), Centers for Disease Control and Prevention. Available at: http://WWW.adc.gov/nch/data/early realse/insur Pdf. [Last accessed 2017 Oct 5]. Corina JG, Hurk VD, Mols FS, Breed PM (2008). Impact of alopecia and scalp cooling on the well-being of breast cancer patients. Psychooncology 16:1786–1794. Davis ST, Benson BG, Bramson HN (2001). Prevention of chemotherapy − induced alopecia. Scand J Clin Lab Invest 291:134–137. Dean J, Salmon S, Griffith K (2000). Prevention of docetaxel − induced hair loss with scalp hypothermia. N Engl J Med 301:1427–1429. Dougherty L (2006). Comparing methods to prevent chemotherapy − induced alopecia. Cancer Ng Pract J 5:25–31. Dougherty L, Lister S (2008). Clinical nursing procedures nursing. Cancer 12:23–25. Grevelman EG, Breed PM (2005). Prevention of chemotherapy − induced hair loss by scalp cooling. Eur Soc Med Oncol 16:352–358. Hackbarth M, Hass N, Fotopoulou C. (2009). Chemotherapy − induced dermatological toxicity: frequencies and impact on QOL in women’s cancers. Support Care Cancer 30:593–597. Hunt N, McHale S (2005). The psychological impact of alopecia. Br Med J 331:951–953. Jam L, Carey M, Jefford M (2009). Non pharmacologic strategies for managing common chemotherapy adverse effects: a systematic review. J Clin Oncol 26:5618–5629. Lemenager M, Lecomte S, Bessa E (2007). Effectiveness of cold cap in the prevention of docetaxel induced alopecia. Eur J Cancer 33:297–300. Lemieux J, Maunsell E (2007). Chemotherapy induced alopecia and effects on quality of life among women with breast cancer: a literature review. Psychooncology 17:317–328. Lewis SM, Heitckemper MM, Direksen SR (2000). Medical surgical nursing: assessment and management of clinical problem. 6th ed. St Louis: Mosby Company. pp. 269–321. MacDuff C, Mackenzie T, Hutcheon A (2003). The effectiveness of scalp cooling in preventing alopecia epirubicin and docetaxel. Eur J Cancer Care (Engl) 12:154–161. Mols F, Hurk C, Vingerhoets M, Breed P (2008). Scalp cooling to prevent chemotherapy − induced hair loss: practical and clinical considerations. Support Care Cancer 17:181–189. Mulders M, Vingerhoets A, Breed W (2008). The impact of cancer and chemotherapy: perceptual similarities and differences cancer patients, nurses and physician. Eur J Oncol Nurs 12:97–102. Munstedt K, Manthey N, Sachsse S, Vahrson H (2006). Changes in self-concept and body image during alopecia induced cancer chemotherapy. Support Care Cancer 5:139–143. National Cancer Institute in Cairo (2005). Cancer Trends Progress Report (2007). Available at: http://WWW.cancer.gov/statistics. Nolte S, Donnelly J (2006). A randomized clinical trial of a videotape intervention for women with chemotherapy-induced alopecia: a gynecologic oncology study. Oncol Nurs Forum 33:305–311. Peck H, Mitchell H, Stewart A (2003). Evaluating the efficacy of scalp cooling using the penguin cold cap system to reduce alopecia in patients undergoing chemotherapy for breast cancer. Eur J Oncol Nurs 4:246–248. Perevodchikova N, Denisov L, Orel N (2000). Scalp hypothermia for prevention of alopecia in patients receiving combination chemotherapy including anthracyclines. Vopr Onkol 33:73–75. Roseman S (2004). Cancer and stigma: experiences of patients with chemotherapy–induced alopecia. Patient Educ Couns 52:333–339. Smeltzer SC, Bare BG (2000). Medical–surgical nursing. 9th ed. Philadelphia, PA: Lippincott Company. pp. 263–311. Ueki R, Tsuboi R, Inaba Y, Ogawa H (2003). Alopecia and hair growth after chemotherapy. J Investig Dermatol 195:209–212. Witman G (1981). Misuse of scalp hypothermia. Cancer Treat Rep 655:507–508.